The Orbit program takes a positive and practical approach to child sexual abuse prevention; an approach that is informed by evidence-based research. Orbit is a sexual abuse prevention program consisting of a computer game, classroom activities, website and associated resources. The program is designed for children aged between 8 and 10. It is a free program created by the University of the Sunshine Coast with financial and in-kind support from the Telstra Foundation, Queensland Police Service, Daniel Morcombe Foundation, Sunshine Cooloola Services Against Sexual Violence Inc. and Curious Bear game development company. The Orbit program is designed to be integrated with your classroom activities over a period of 5 to 10 weeks. The computer game is not a standalone resource, it is designed to be played weekly alongside the classroom activities that extend and reinforce key learnings from the game. These classroom activities are provided in the Orbit Teachers’ Guide. Additional classroom activities are also provided in the Classroom Activities section of this website. The teacher’s role is paramount in delivering this program. Your role is to provide students time to play the computer game and deliver the lessons as outlined in the Orbit Teachers’ Guide. Statistics tell us that in any class of students, it is likely that there will be one or more children who will experience some form of sexual abuse before reaching adulthood. Usually perpetrators of child sexual abuse are known to the child and also known to (or part of) their family. Therefore, for these children, school is likely to be an environment that does not have a connection to the perpetrator. Hence, you should be prepared to receive disclosures of sexual abuse from your students. For more information on how to respond to a disclosure, visit the Disclosures section of our website where you can also download a printable wallet card containing sentence prompts that you can keep with you at all times. Although receiving a disclosure can be difficult and emotional for both you and the child, it is important that children have responsible adults they can turn to who can help keep them safe. When following up on a disclosure, it is important to follow your school’s policies and procedures related to reporting sexual abuse. Familiarise yourself with them prior to starting the program. How do I use Orbit in my class/school? sign up for a teacher account. Additionally, there are extra optional classroom activities that you can use with your students. Before implementing the program, we also suggest you discuss the program with your Principal and your school’s parents’ association. You may also like to hold an information night for parents. alter students’ game progress forward or backward. You may like to use this functionality if a student has been away from school for an extended period of time or if a student would like to revisit a particular section of the game. 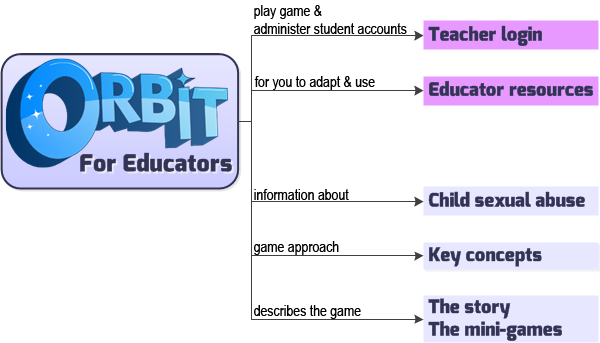 From the Educator resources section you can download the Orbit Teachers’ Guide and the set of lesson plans that accompany the Orbit game. You can also find some Additional classroom activities. Go to the Child sexual abuse section of this website to find out more about child sexual abuse, including how to respond if a child discloses to you that they have been sexually abused. Visit the Key concepts section of the website to find about the key concepts addressed in the game. These are also designed to be used by parents/caregivers as they are filled with ideas for discussing these topics with children. You can go to The story and The mini-games sections to find out what happens in a particular part of the game. The development of Orbit was informed by evidence-based research and was built in collaboration with counsellors, psychologists, social workers and educators. or sign up for a teacher account.